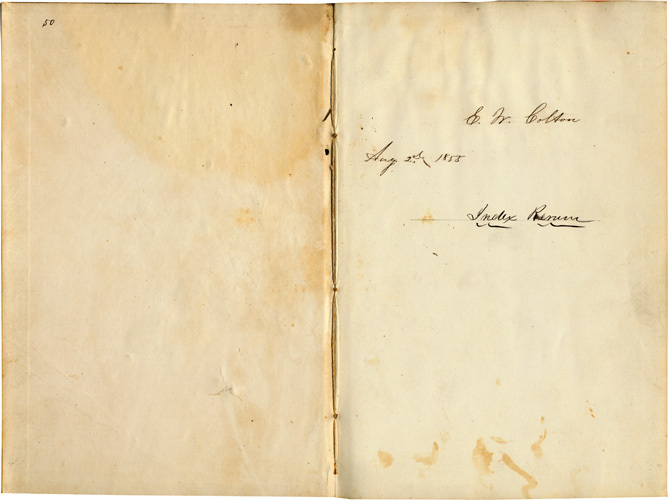 This is not the John Todd book, but rather a manuscript notebook belonging to E. W. Colton, dated on its front flyleaf Aug. 2nd, 1855. It is smaller than the Todd volumes, at approximately 5.5 inches wide, 8.5 inches high. The scans of these spreads are to scale, relative to Todd. 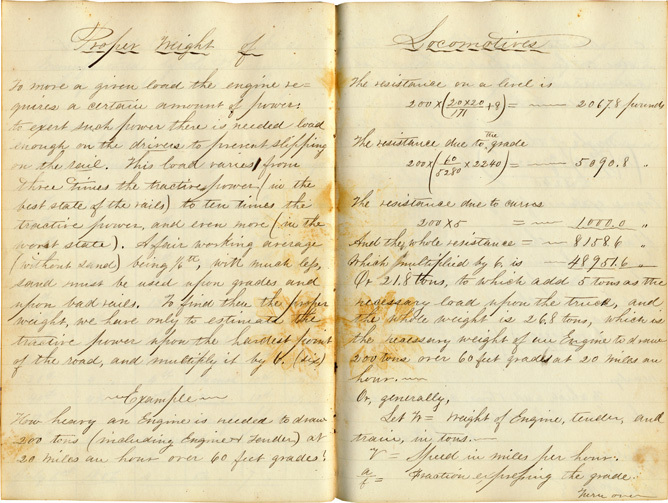 This volume contains newspaper articles (pasted in and loose, on land and other topics); Formulae for casting contents of earth; Prices for Grading &c of the Delaware Railroad; Prismoidal Rule; formulae for Hair Wash, Furniture Polish, Hair Restoration, Rx for Mending Rubber Boots, etc. 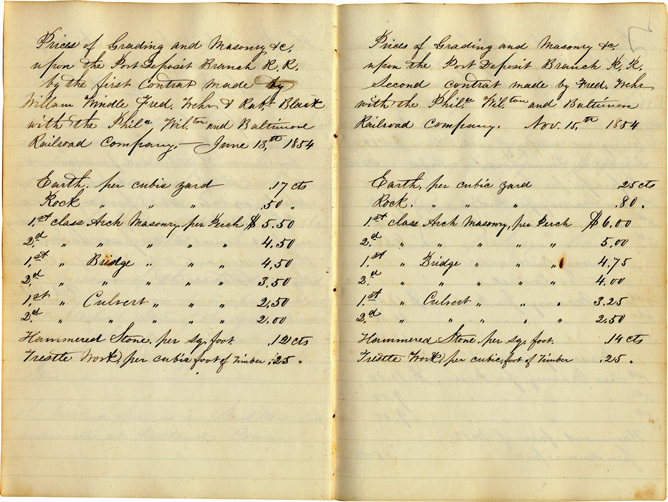 ; a stamped receipt for payment to Edward Banks for labor (July 23, 1870). Stationer's stamp reads : J. T. Heald / Blank Book Manufacturer / 127 Market St./ Wilmington, Del. E. W. Colton was E. Wells Colton, evidently of Northfield, Massachusetts. Some entries are dated as late as 1873. The above article on The Proper Weight of Locomotives continues to a third page, and concludes with copied from the R.R. Advocate, July 11th, 1856. Colton evidently was involved in rail, bridge and road building, and other civil engineering work. Clipped articles laid into the book are from Philadelphia and Delaware papers; a manuscript deed for a property is dated 1836, in Maryland. 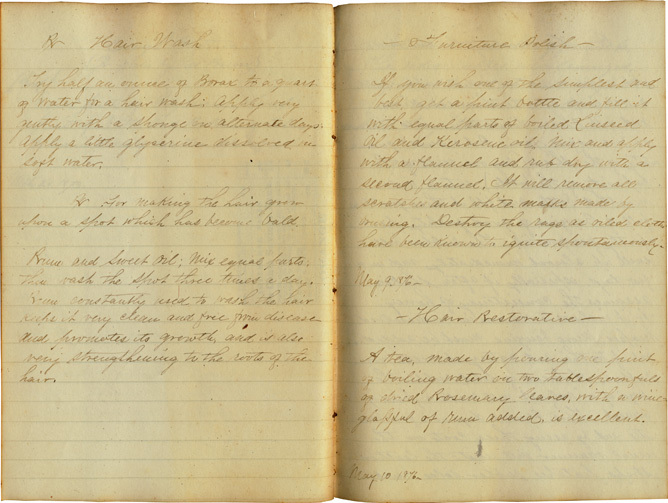 There are several pages of recipes such as below; also, some clippings, e.g., Washing for Roofs and Buildings, taken from the Boston Journal of Chemistry.